Ethnos360 Aviation would be able to service many more church planting works in Western Brazil with an R66 helicopter. Watch the video, and if this project stirs your heart, you can donate here. Your aviation skills and training can help missionaries plant churches faster by supporting their needs for safe transportation to remote areas. Ethnos360 Aviation is much more than just transporting people and supplies — missionary pilots also take an active part in the spiritual encouragement of missionary co-workers and the indigenous church. Visit our Ethnos360 Aviation website to view available positions or learn more about Ethnos360 Aviation — read our purpose, vision and values and answers to frequently asked questions. All candidates for service with Ethnos360 Aviation must complete missionary training with Ethnos360 and undergo a technical skills evaluation with Ethnos360 Aviation. Missionary pilot candidates should have begun flight training before age 30. Missionary pilots guide aircraft to a safe arrival at a bush location. Missionary pilots also minister as encouragers to the church-planting teams working in remote areas. Without access to a neighbourhood grocery or pharmacy, these teams require equipment, medicine, medical evacuation and mail to be supplied by air. Maintenance technicians keep aircraft in excellent flying condition by performing all procedures necessary to comply with FAA standards and the standards of the host country where they work. Keeping in mind the precious cargo that the planes carry, these technicians dedicate themselves to the highest standards of aircraft maintenance. Avionics technicians service aircraft radio systems and equipment, high-frequency communication radios for the church-planting teams living in remote areas, other electronic equipment and, at times, computers. Often, there are no telephone services in the jungle, which makes the radio a vital communications tool. Interested in being a missionary pilot? Sign up for prayer emails, quarterly newsletters or a calendar. Teach your kids about missions and about cheerfully giving to the Lord while helping to spread the Good News to unreached people groups in Brazil. 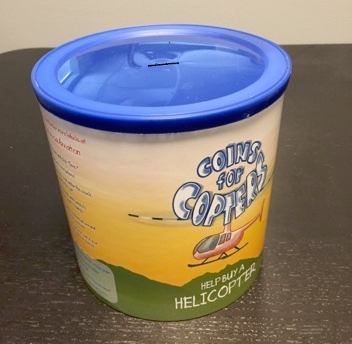 Collect your loose change from now until June, and then bring the funds to the Kids Open House.